The story of Touki Bouki goes back centuries: men have always set out for new lands where they believe time never stops… Only few adventurers seem to make it, but that has never stopped anyone… Djibril left his country with the dream of finding success and solace in Europe. He soon discovered, however, the cruelty of life. While his dream fell apart little by little Djibril found he was unable to leave “Europe”, his host country. That was when returning to Africa became the real dream for him. Ending his days in Africa was a dream he would never fulfill. 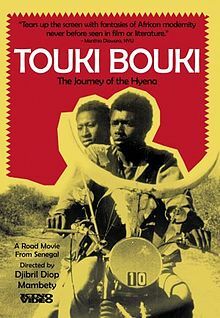 “Touki Bouki” is a prophetic film. Its portrayal of 1973 Senegalese society is not too different from today’s reality. Hundreds of young Africans die every day at the Strait of Gibraltar trying to reach Europe (Melilla and Ceuta). Who has never heard of that before? All their hardships find their voice in Djibril’s film: the young nomads who think they can cross the desert ocean and find their own lucky star and happiness but are disappointed by the human cruelty they encounter.